Front row (left to right): 1. Lenny Ledford, 2. Gerald Mann, 3. unidentified, 4. unidentified, 5. unidentified, 6. unidentified, 7. Peter Vargas, 8. unidentified. Second row: 1. Jackie Ayer, 2. unidentified, 3. unidentified, 4. unidentified, 5. unidentified, 6. unidentified, 7. Vera Bowers, 8. unidentified. Third row: 1. Rose Marie Mueller, 2. unidentified, 3. unidentified, 4. unidentified, 5. unidentified, 6. Marilyn Rummell, 7. unidentified, 8. Judy Merkle, 9. Mr William S. Carr. Fourth row: 1. Ted deTreville, 2. Harold Baker, 3. Leroy Irwin, 4. unidentified, 5. Charles (Chuck) Romero, 6. Leonard Becker. Possibly unidentified in the picture: (The following names were autographed on the back of the picture, but have not been identified in the picture.) Sue Vaughn, Jackie Gyen, Charlene Darny, Raymond Fereira, Robert Bush, Marilyn ? (there is a signature for Marilyn Rummell, so this must be another Marilyn), Teresa Davis, Wilma Steward, John McShea, Billy Wall, Robert Dorn, Caroline Rodrigues, Kay Farrar, Norma Davidson, Francina Threlkeld, George Andrews, Joann Oleta Yohe. Credits: From the collection of John deTreville, whose late brother Ted deTreville was in the class. In an e-mail to the archive, Al Shelly wrote: "Mr. Carr was a good man. He taught me elementary trig and was one of the football coaches. He died young, of a heart attack at school maybe four or five years after this picture." Judith Merkle added: "Al Shelly is right about Mr. Carr. He was a wonderful person, and I was fortunate to have him in 8th grade. I was eleven years old and bored to tears with the curriculum, and he let me bring a zillion library books to school and read them by myself while everyone else was doing the dull stuff. The only rule was that I had to take the regular exams with the rest of the class. Funny to think of it, but the things I read back then were the foundation of my later work as a novelist. Mr. Carr died of a heart attack, while playing ball with kids on the playground. He was honorable, decent, and kind. I've always believed he deserved a special place in heaven." Al also noted that Lenny Ledford became a body-building champ long before the vogue, Marilyn Rummel went to the National Spelling Bee, Judy Merkle is now the well-known author Judith Merkle Riley, and Leroy Irwin was the Cowboys main quarterback in 1957. The kids in the picture are members of the high school graduation class of 1958. 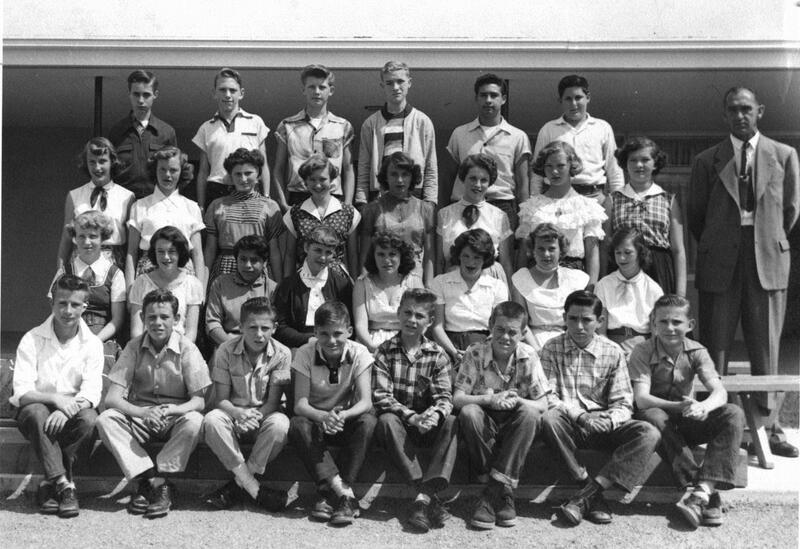 To find other pictures of the class of 1958 in the archive, see Livermore class pictures listed by year of high school graduation: 1958. And if you have any pictures of the class of 1958 that you would like to share, please submit them to the Archive.